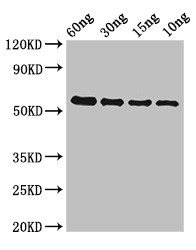 Metalloprotease capable of the hydrolysis of insoluble hydrophobic substrates. Hydrolyzes azocoll and gelatin and, at a lower rate, soluble and insoluble collagens. Does not cleave short synthetic peptides. Preferentially hydrolyzes the 24-Phe-|-Phe-25 bond in the insulin B-chain, followed by the 5-His-|-Leu-6 bond. Inactivates endothelin-1, primarily by cleavage of the 5-Ser-|-Leu-6 and 16-His-|-Leu-17 bonds. Hydrolyzes the alpha chain of C3 to generate a C3b-like protein. Inhibits complement-mediated hemolysis and opsinization of bacteria. Hydrolyzes the insect antimicrobial peptide cecropin. Decreases the length of E.faecalis chains via the activation of autolysin. Degrades polymerized fibrin.